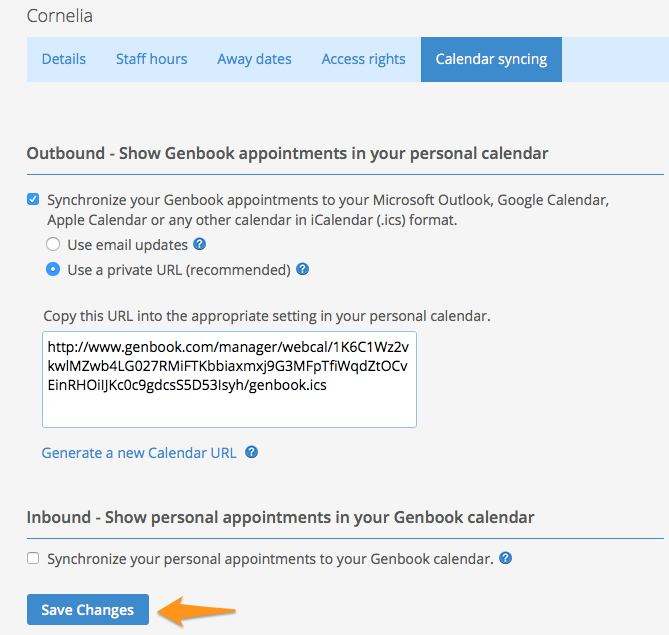 There are two ways to set up Calendar Synchronization, so that your Genbook calendar updates an external calendar on the Web or on your computer. The first, via email, is explained here. The following directions are for sharing and subscribing to your Genbook calendar via a webcal/iCalendar URL. Go to the individual staff member’s “Calendar Syncing” section, by navigating to the Settings page via the gear icon at the top right, then clicking “Staff”, the staff member’s name, then “Calendar Syncing”. 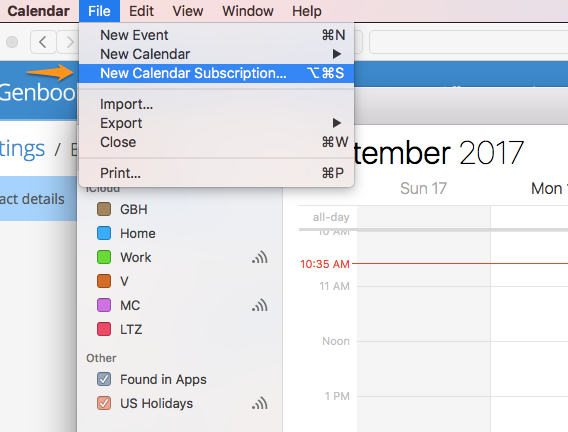 Save any changes you make (including just enabling the sync option) BEFORE you attempt to subscribe to the calendar. You’re now ready to copy your Genbook calendar’s private URL and paste it into the appropriate place in your external calendar, so long as that calendar allows you to subscribe to other calendars’ feeds via a URL. Below, we’ve outlined the process for subscribing to your Genbook calendar in Google, Apple Calendar (aka iCal) and Outlook. Click the arrow beside “Other Calendars”, along the left side of the screen, then "Add by URL". Next, paste the URL into the filed provided and click the "Add Calendar" button. 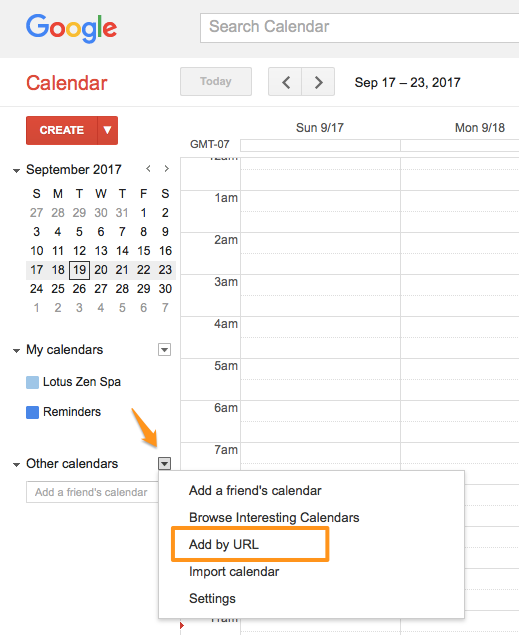 Click in the ribbon on “Open Calendar” and choose “From Internet…”. Paste the URL into the box that pops up and press OK.
Open Calendar and click on File and then “New Calendar Subscription”. On the last screen, you can change the calendar name, description, etc. We recommend setting the Auto-Refresh rate to “Every 5 minutes”. Also, if you do not use iCloud to sync your Apple device Calendars (iPhone, iPad, iPod Touch, etc. ), you’ll want to change the Location to “On My Mac”. 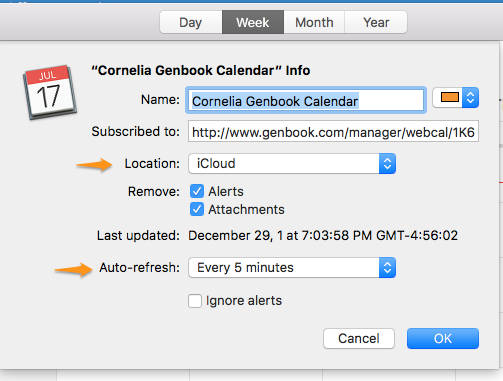 Otherwise, if you do want your Genbook Calendar subscription to appear on all your iCloud synced devices, choose the “iCloud” Location option. 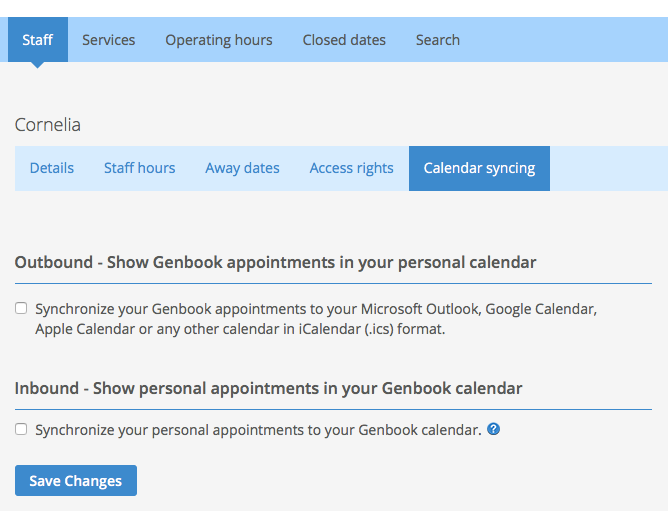 Your Genbook appointments should then be visible in your external calendar.